Google has opened the developer network for Indian developers since it's second Android update. However, due to Google's lack of payment processing division in India, it's not easy to release app on Play Store. You may face problems from registering developer account to setting up recurring billing system. However there are ways to get around this limitation. Here's my experience as a solo developer to publish the free Android app on Developer console. 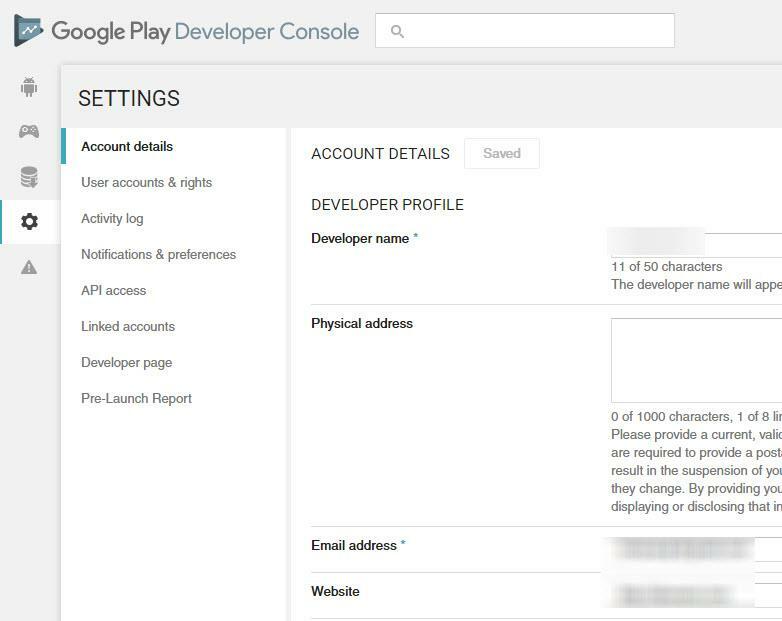 Google developer console requires that you have a Google account. You can create an account during the registration. Or you can use the existing account. Do not keep this account on two step authentication as you'd require a lot of SMS to deal with while updating your developer account. So you need to remove that during the sign up process. This step varies per account as some users are required to verify their phone during this process. If you complete this step successfully, then you'd be prompted to the next step of payments. This is one of the complicated step. As Google Wallet is not available for India, which in turn makes it harder for developers to register account. Here you are required to use the credit card to open the developer account. If you do not have the credit card or debit card with international usage feature, then you can't sign up. Some of the banks whose debit card can be used for international transactions are - Kotak, HDFC, ICICI, AXIS and HSBC. You may find that PSU banks or Semi PSU banks Debit card would not work in this process. And you'll be forced to get a credit card or get international usage enabled debit card. I have used Kotak's Privy league platinum card. Considering I am a privy league user, the bank has given me the access to international transactions without additional fees. So I managed to register without anything additional settings on my part. After finishing this step your email gets the receipt such as this. You need to add developer profile information that appears on your app profile. The name that you add here will reflect on that page. Any information specific to the developer should appear here. And there is also one field for the business address. This should be same as that of the merchant account business address. You may also need to keep real name, phone number and email address listed there. You can change this information later. 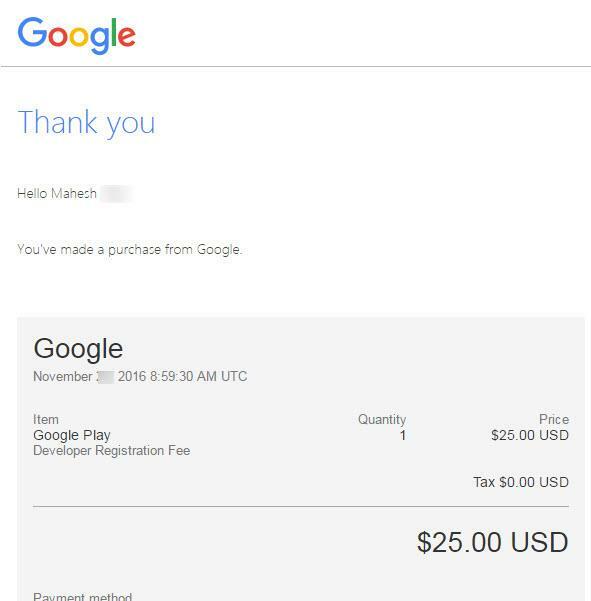 However the base email address remains the same as Google takes that account tied to the payment. If you wish to assign payment to your app, then you need to register for merchant account. Merchant account allows you to make your app to get in-app purchase system. Also the same system allows you to sell the app through the Google Play Store. Do note that you have to use either proprietory name or the business name there. 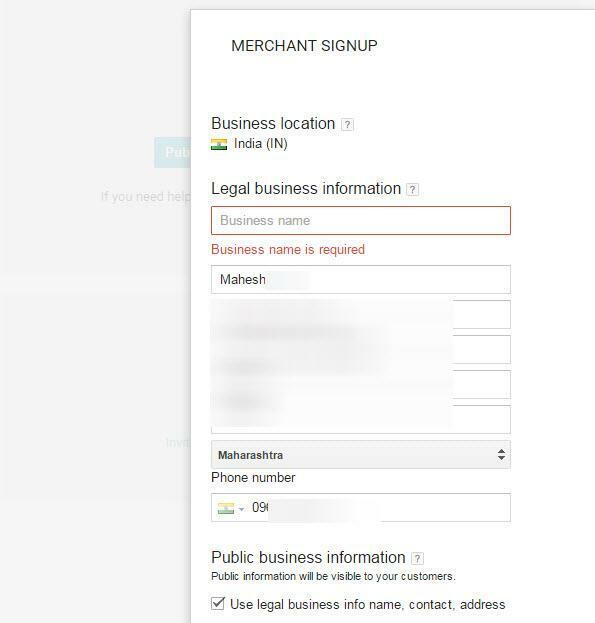 There is no additional cost added to registering merchant account inside. It just requires your business name so that it appears on the transaction and during the money processing. If you have signed up for the merchant account then using the in-app purchases and subscription is possible. If you have not signed up for merchant account, then you're forced to make your app free of cost. If you are unsure how to charge for your app, then set the app to in-app purchase model. And then later either add paid subscription or add the ads into the app. In case if you get confused it helps to set the app free with in-app purchase model. You don't have to sign up for AdSense and Admob. Those are popular and in demand choices that people make. However you can make more money from other ad networks if you are developing game or app that has social media traffic. In this step, you have to add your app into the app store. 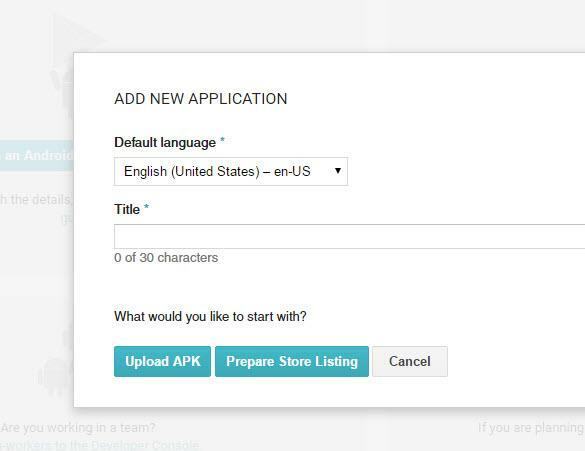 You need to make sure that your app .apk file is signed with key. This apk needs to be uploaded to the dashboard. If this file is not signed then your apk will be rejected. You also need to mention how many permissions your apk is requesting during the install. That decides the approval time. In this step you have to make sure to choose the right pricing. If your app is set to free download then you can't change this step. Thne your app remains free forever. If you wish to charge for this app, then you'd be forced to create another entry in future. So it helps to set your app for in-app purchase setting from the start. App approvals are not instant. In some cases it takes one week or more. If your app is in specific category which requires testing, the app takes longer for approval. In my case the app has taken more than 7 days for approval. And I am waiting for my app to be approved. Considering the app is free and has no monetization plans, I am assuming it'll be approved within next week. After approval developer gets the dedicated page for the app. Any app that once gets approved is shown on dashboard. So your dashboard will display the analytics of that app. Any download, uninstall, updates will be displayed on the dashboard. The analytics regions includes the amount of downloads, Android version and other information. From here onwards you can push the updates of the app on regular basis. You can also add or remove the ads in the app with each update. Experimenting with the ads is possible with the analytics data on your dashboard. Publishing App on Google Play Store is a good experience for developer. Apart from monetization there are lot of things to be learned while publishing your app. The above mentioned experience taught me it's not easy to publish an app as a solo developer. It requires a lot of financial and mental preparation to publish and maintain the app on Play Store. Do we need to register the app name before publishing? I was afraid about whether debit cards are accepted or not. Thanks for the information.